Hair loss is a very disheartening experience, and one that can occur for any of a variety of reasons. Alopecia, thyroid problems, physical trauma, certain medications, and emotional stress are just a few of the many causes of hair loss. In addition, some women experience hair loss after pregnancy. Whatever the cause, experiencing thinning hair or balding isn’t something most people want to go through. It can be embarrassing, make you feel prematurely old, or affect your self-esteem and self-image. The good news for hair loss sufferers is that there are plenty of hair loss solutions that can prevent you from going bald, or even regrow your hair. Our compounding pharmacy works with many different active ingredients to create hair loss treatment medications that address your specific needs. When you choose to have a compounding pharmacy process the medications and treatments that can help stimulate hair growth and prevent hair loss, you have more options -- and more customized solutions -- than you would get from using over-the-counter hair growth products or even conventional prescription medications. That’s because we can formulate hair loss and regrowth treatments using a variety of delivery mechanisms -- such as topical creams, foams and shampoos. The active ingredients we use are some of the most widely-used and recognized names in hair regrowth, such as Minoxidil. We can also compound a progesterone or estrogen formula for those who are suffering hormone-related hair loss. CareFirst Specialty Pharmacy is dedicated to providing personal attention and meeting your unique needs with every prescription we fill. Let us help you with specially compounded medications to stop hair loss and promote hair growth. We recognize that hair loss is not only a complex medical condition, but one that affects every aspect of the hair loss sufferer's life. Hair loss affects as many as 50 million people in the United States, men and women alike. If you’re experiencing hair loss and you and your doctor are looking for medication treatment options then contact us. For male patients - Androgenetic alopecia (AGA) or common male pattern baldness (MPB) or hair loss due to hormonal causes, makes up 95% of male hair loss cases. By the age of thirty-five, two-thirds of American men will experience some degree of appreciable hair loss, and by the age of fifty approximately 85% of men have significantly thinning hair. Approximately twenty five percent of men who suffer with male pattern baldness begin the painful process before they reach the age of twenty-one. Many women also experience female pattern hair loss. When androgenetic alopecia affects women it is called female pattern alopecia or female pattern baldness. Hair loss in women is different than that of men, with hair thinning tending to be more diffuse. Although for both men and women androgenic alopecia is the most common form of hair loss, doctors also see many people with other forms of alopecia. Many medical conditions also have alopecia as a primary symptom. At CareFirst Specialty Pharmacy we compound unique formulas that may improve results. Many patients use topical treatments with one or multiple actives in topical solutions, foams, scalp lotions and shampoos. Call us to learn more about our compounded treatments for hair loss. 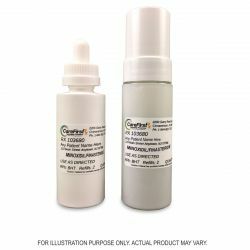 Sample Formula - latanoprost 0.01% and minoxidil 5%. Each drug acts on a different prostaglandin and synergize to restore the prostaglandin balance. Our formula uses a special foam base, which is a creamy, drip free foam formulation with a light skin feel that work very well on the scalp. It is very easy to apply and skin friendly maximizing patient comfort and for optimal treatment results. We compound high strength Minoxidil and Minoxidil and Finasteride in a scientifically advanced and exclusive foaming easy to apply formula.